In the long run, as the Nobel laureate Paul Krugman has written, productivity is almost everything. But what drives productivity? The answer is know-how. It is because humanity has discovered, developed, deployed, and disseminated useful knowledge that an ever-rising proportion of the world’s population is at last escaping the “poor, nasty, brutish and short” lives of our ancestors, pithily described by the philosopher Thomas Hobbes in the 17th century. Knowledge is also somewhat paradoxical. It is most productive when freely available. But the incentive to create it depends on the ability to restrict its use. The former consideration justifies dissemination. The latter justifies control. How, then, is this balance working? The latest World Economic Outlook offers an illuminating chapter on how globalisation has been helping to spread useful knowledge. This analysis sheds light on the contemporary landscape of innovation, on the current diffusion of knowledge, on what is happening to productivity, on the role of global value chains and on the impact of competition on creation and use of knowledge. The slowdown in patenting and, to a lesser degree, spending on research and development in the high-income countries parallels the slowdown in productivity. There is much debate on the causes of the latter. Some argue that the latter will naturally reverse. Others suggest the flow of good new ideas is slowing at the productivity frontier for more fundamental reasons: it is simply harder to make big breakthroughs. Meanwhile, emerging economies are benefiting from applying already developed ideas within their own economies. That is how the diffusion of economic growth has worked since the industrial revolution (indeed, before). Globalisation, it appears, has accelerated the rate of diffusion by lowering the obstacles. This has occurred via foreign direct investment and via the unbundling of production via global value chains. Access to foreign know-how fertilises invention: thus, the greater the knowledge inflow, the stronger becomes domestic patenting. This is not only true for emerging countries. It is also true for those at the knowledge frontier. Access to foreign knowledge also promotes productivity, as one would hope. Not surprisingly, this effect is particularly important for emerging economies. Yet, unfortunately, the growth of labour productivity has slowed almost everywhere since 2004, perhaps because of the global financial crisis. A particularly important conclusion of this analysis is that greater competition — one of the benefits of economic globalisation — accelerates the diffusion of technology across countries and even the rate of innovation itself. One explanation for the latter might be that returns to innovation are increased by access to a bigger global marketplace. What do these findings tell us about the state of the global knowledge economy and appropriate policy towards it? The most important conclusion is that the global diffusion of knowledge is an important benefit of globalisation. Over time, this adds significant new contributors to the development of useful knowledge. The addition of hundreds of millions of minds must be a good thing for all. This is now the case with China, as it once was with the entry of Japan and South Korea into the business of creating new knowledge. Unfortunately, what is happening today is not just the entry of new innovators, but an apparent slowdown in the rate of innovation and productivity growth in the advanced countries. This is yet another reason why their voters, business leaders and politicians have become more defensive. Yet if there is one lesson from two centuries of unprecedented economic growth it is that old knowledge ultimately becomes a widely-available commodity. The most important task for the advanced countries is to create useful new ideas. On that will their futures ultimately depend. Achieving this will require not just well-designed intellectual property rights, but government support for fundamental science and breakthrough technologies, as was the case for the internet some decades ago. A particularly important aspect of the globalisation of useful knowledge is the relationship of the west with China. One of the tragedies of the Trump administration’s blunderbuss approach to trade policy — leave no friend untargeted, usually for no good reason — is that it has alienated potential allies in its attempt to tackle the forced transfer of know-how by China. Yet even Chinese policymakers understand that the future of their economy depends on incentives for developing and disseminating new IP. The US should be pushing on an open door. Above all, it is not just about protecting IP. It is also about recognising that it can be an obstacle to competition. It is still more about focusing on the future. A world in which innovation is more widely shared is both inevitable and desirable. This is a future we ought to want. The old monopoly is gone. Good. NEW HAVEN – On the surface, United States Trade Representative Robert Lighthizer appears to have made an ironclad case against China in the so-called Section 301 report issued on March 22. Laid out in a detailed 182-page document (which, with 1,139 footnotes and five appendices, would make any legal team blush with pride), the USTR’s indictment of China on charges of unfair trading practices regarding technology transfer, intellectual property, and innovation seems both urgent and compelling. It has quickly been accepted as foundational evidence in support of the tariffs and other punitive trade measures that President Donald Trump’s administration has initiated against China in recent months. It is powerful ammunition in a potential trade war. But don’t be fooled. The report is wide of the mark in several key areas. First, it accuses China of “forced technology transfer,” arguing that US companies must turn over the blueprints of proprietary technologies and operating systems in order to do business in China. This transfer is alleged to take place within the structure of joint-venture arrangements – partnerships with domestic counterparts which China and other countries have long established as models for the growth and expansion of new businesses. Currently, there are more than 8,000 JVs operating in China, compared to a total of over 110,000 JVs and strategic alliances that have been set up around the world since 1990. Significantly, US and other multinational corporations willingly enter into these legally-negotiated arrangements for commercially sound reasons – not only to establish a toehold in China’s rapidly growing domestic markets, but also as a means to improve operating efficiency with a low-cost offshore Chinese platform. Portraying US companies as innocent victims of Chinese pressure is certainly at odds with my own experience as an active participant in Morgan Stanley’s joint venture with the China Construction Bank (and a few small minority investors) to establish China International Capital Corporation in 1995. Yes, as we joined with our partners in creating China’s first investment bank, we shared our business practices, proprietary products, and distribution systems. Yet, contrary to the assertions of the USTR, we were hardly forced into these arrangements. We had our own commercial objectives and wanted to build a world-class financial services firm in China. By the time we sold our stake in 2010 – at a rather attractive return to Morgan Stanley shareholders, I might add – CICC was well on its way to attaining those goals. The second area where the USTR’s Section 301 report is problematic is its portrayal of China’s focus on outward investment – its “going out” strategy – as a unique state-directed plan aimed at gobbling up newly emerging US companies and their proprietary technologies. In fact, the report devotes more than twice as many pages to charges concerning China’s supposed external technology theft via such acquisitions – which are framed as a blatant grab for America’s most precious assets – as it does to internal transfers through JVs and alleged unfair licensing practices. 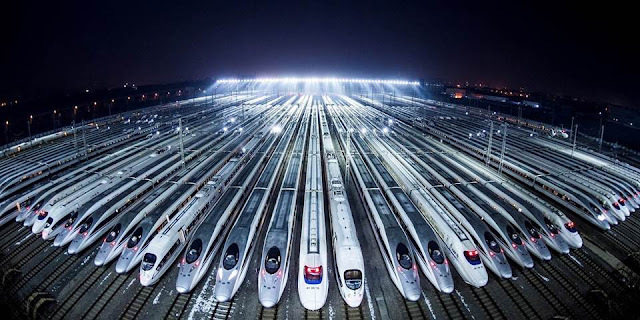 As such, the Made in China 2025 campaign is presented as prima facie evidence of a devious socialist plot to attain global dominance in the great industries of the future: autonomous vehicles, high-speed rail, advanced information technologies and machine tools, exotic new materials, biopharma and sophisticated medical products, as well as new power sources and advanced agricultural equipment. Never mind that industrial policies are a time-tested strategy for developing countries seeking to avoid the dreaded middle-income trap by shifting from imported to indigenous innovation. China is accused by the USTR of sponsoring a unique strain of state-directed, heavily subsidized industrial policy unfairly aimed at snatching competitive supremacy from free and open market-based systems like the US, which are supposedly playing by different rules. Yet even developed countries have relied on industrial policy to achieve national economic and competitive objectives. It was central to Japan’s so-called planned rational development state, which underpinned its rapid growth in the 1970s and the 1980s. The Ministry of International Trade and Industry perfected the art of state-subsidized credit allocation and tariffs to protect Japan’s sunrise industries, an effort that was matched by Germany’s equally impressive Wirtschaftswunder, augmented by strong support for the Mittelstand of small and medium-size enterprises. And, of course, it was US President Dwight Eisenhower who in 1961 drew attention to America’s powerful military-industrial complex as the linchpin of state-sponsored, taxpayer-funded innovation in the US. NASA-related spinoffs, the Internet, GPS, breakthroughs in semiconductors, nuclear power, imaging technology, pharmaceutical innovations, and more: all are important and highly visible manifestations of industrial policy the American way. The US simply does it though its federal defense budget – where outlays of close to $700 billion this year are more than the combined total earmarked for defense in China, Russia, the United Kingdom, India, France, Japan, Saudi Arabia, and Germany. Yes, the USTR is entirely correct in underscoring the role that innovation plays in shaping any country’s future. But to claim that China alone relies on industrial policy as a means toward this end is the height of hypocrisy. Cyber-espionage is the third leg of the stool in the USTR’s case against China. In this area, there can be no mistaking the evidence underscoring the role played by China’s People’s Liberation Army as a major actor in cyber intrusions directed at US commercial interests. These problems were, in fact, so serious that President Barack Obama presented top-secret evidence of state-sponsored computer hacking to President Xi in September 2015. Since then, most reports point to a reduction in Chinese incursions. Unfortunately, the evidence cited in the USTR report in support of cyber-related trade violations largely predates that confrontation. In short, the USTR’s seemingly impressive Section 301 report is a biased political document that has further inflamed anti-China sentiment in the US. As a result, Chinese-sponsored intellectual property theft is now taken as a given by an America that increasingly sees itself as a victim. Yes, like the rest of us, the Chinese are tough competitors, and they don’t always play by the rules. For that, they need to be held accountable. But the case made by the USTR is an embarrassing symptom of a scapegoat mentality that has turned America into a nation of whiners. Outside the United States, the U.S. has become punching bag, punchline and declining power all at once. The term “multipolar world,” once simply wishful thinking, is now being uttered by U.S. friends and foes alike. Twenty-six years after the Soviet Union fell, the U.S. elected another man who promised to make America great again, and the concept of multipolarity from the Nixon days was resuscitated. Multipolarity is a fancy word with a simple definition. It is the idea that power is not dominated by one country but distributed among multiple countries. China is seen as the eventual challenger to U.S. supremacy, but in a multipolar system, there has to be more than one. Russia, India and Germany are a few of the other contenders. When Russian and Chinese political figures speak about a multipolar world, they are speaking about the world they want to see, not the world that exists today. Unsurprisingly, the world they want is one in which they have a greater share of power than they have now. It is a particularly useful concept for countries like Russia and China, which have a history of mistrust and very real geopolitical imperatives driving them toward zero-sum competition. Proponents also tend to use the U.S. as both a scapegoat and a lightning rod: The root of the world’s problems is the level of power the U.S. holds globally. The inverse is also sometimes true. Proponents of a unipolar system often dismiss setbacks in American foreign policy because setbacks don’t comport with their unrealistic visions of U.S. hegemony. Perhaps the simplest way to address this question is to ask what country is driving these events. On the Korean Peninsula, it was Kim Jong Un who accelerated Pyongyang’s nuclear weapons program, but it was the U.S. that deployed three aircraft carriers to the region and threatened fire and fury against the hermit kingdom unless it backed down. Now North and South Korea are negotiating, and even recalcitrant China is getting tough on the North. In Iran, the nuclear deal is under strain because of U.S. threats to withdraw. European countries, led by France and Germany, don’t want to lose access to what Europeans have always wanted out of Iran – cheap oil. If Trump refuses to renew the sanctions waiver on May 12, banks in countries that do not reduce Iranian oil imports will face sanctions. And for most, cheap Iranian oil is not worth the price of U.S. sanctions. As for China, the U.S. made the first move to revamp the bilateral trade relationship, because the U.S. has more leverage in this relationship – China needs to export to the U.S. more than the U.S. needs to import from China. For the first time in almost 60 years, a Castro is no longer Cuba’s head of state. Last week, Miguel Diaz-Canel was sworn in as Cuba’s president, elevated from his previous role as first vice president. He has promised to modernize the country’s social and economic model, including dismantling its dual-currency system and leveraging the internet for greater good, but he also committed to retain its socialist trappings. However, many Cubans are skeptical of how much good Diaz-Canel could bring them, and in fact are worried about making ends meet in the new regime, according to experts who spoke to Knowledge@Wharton. The dual currency system has a Cuban convertible peso (CUC) that is pegged to the dollar, and a Cuban peso (CUP) that is worth 1/24th of the CUC. The Cuban peso is used to pay state salaries and to set most domestic prices, while the convertible peso is used by tourists and multinational firms. Diaz-Canel has limited powers because his predecessor Raul Castro will continue to head the Communist Party of Cuba and control the military that runs much of the country’s businesses. Raul Castro fought with his brother Fidel in the revolution that swept them into power in 1959 and served as Cuba’s president for a decade after Fidel Castro stepped down in 2008. Among the other challenges that Diaz-Canel will face is an increasingly complicated relationship with the U.S., as the Trump administration has moved to roll back Obama-era policies that promoted renewed relations and business engagement with the island nation. “While there is a change of leadership in name, there may not be that much of a change in philosophy,” said Gustavo Arnavat, a senior adviser at the Center for Strategic and International Studies in Washington, D.C. and a former Obama Administration official who represented the U.S. at the Inter-American Development Bank. Diaz-Canel inherits all of the challenges that Raul Castro was facing, such as a stagnant economy and unhappiness among Cubans over their standard of living, Arnavat noted. “They are expecting structural reforms that will allow them to have better lives,” he said. Guerra highlighted two major changes that will hit Cubans hard in the Diaz-Canel presidency. One is the end of the dual-currency system, which “will impoverish Cubans even further because those items and goods sold in pesos, which is what they get paid in, will now be sold in dollars,” she said. The Cuban state has wrestled with the rise of the entrepreneurial class in the country after 1992, when it first allowed people to be self-employed because the state couldn’t provide full employment, said Guerra. “The Cuban state has seen the entrepreneurial sector as its primary rival for the tourist dollar but also as a competitor for control of public discourse,” she added. Raul Castro last year also attempted to rein in the entrepreneurial class by declaring a moratorium on further licensing for self-employed workers. “He declared it had been an error to expand [the entrepreneurial] sector to the degree that it had,” Guerra noted. Cuba’s parliament last July passed updated economic guidelines that said a “concentration of property and financial and material wealth” wouldn’t be permitted in the non-state sector, the Miami Herald reported. The end of the dual currency system will also hurt Cuba’s real estate market, and that is also a matter of concern for many Cubans, said Gioioso. Investors including Cuban Americans in South Florida and elsewhere in the U.S., in addition to Cubans living in Spain and Mexico, have thronged Cuba’s real estate markets, and “a significant amount of [that] foreign investment is through irregular ways,” he added. Without the dual currency system, much of the foreign investment that was possible through the dollar-linked CUC will face constraints, he said. Resetting Ties with the U.S. The Trump administration’s rhetoric over unwinding Obama’s pro-Cuba gestures has not been matched with action, apart from a few rollbacks. Some 80%-90% of the more liberal regulations introduced under Obama remain in place, said Arnavat. Gioioso said the Obama administration brought optimism among Cubans about how openness with the U.S. would create better bilateral relations and increase tourism revenues to Cuba. However, Trump’s rollback of some of the Obama-era normalization policies “creates more confusion than anything else,” and the outlook on that front will depend on how the Trump administration articulates its Cuba policy, he added. Diaz-Canel’s ability to correct any of Cuba’s woes is limited. Guerra noted that as head of the army, Raul Castro is also CEO of GAESA, the army’s business conglomerate. GAESA controls roughly 60% of the country’s economy through its various arms, including the Gaviota hotel chain and TRD, the military retail chain.